Dual Chamber filter that removes radiological contaminants from fresh water supplies AND many other contaminants. Removes up to 90% of fluoride and up to 99.99% of contaminants and pollutants that may be found in fresh water supplies including chemicals (VOC’s) such as MTBE, Benzene, Chlorine, Chloroforms, DDT (THM’s); Dissolved Solids (heavy metals) such as Lead, Mercury, Copper, Zinc, Aluminum Arsenic, Asbestos, trihalomethanes, PCB, PCE, Chromium 6, and other detergents and pesticides. Removes up to 99.99% of Radiological Contaminants listed below. 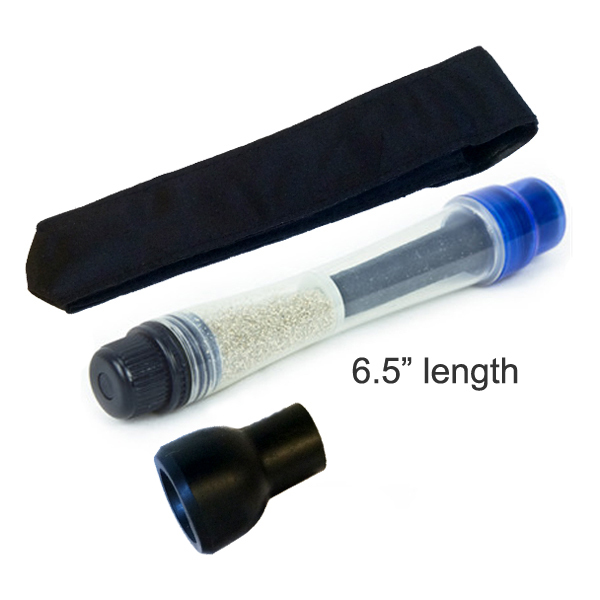 Filters and produces up to 25 gallons of great-tasting water. Seychelle™ water filters are made using electro-magnetically charged resin that attract different contaminants in your water like chemicals and heavy metals. As water passes through the porous body of the water filter, these impurities are drawn to the surface walls of the filter where they remain trapped. All Seychelle™ water filtration products have been tested around the world for their efficacy, and they have been proven to offer the greatest reduction per contaminant in the industry. The filter will not wear out, per se. However, the maximum filtering capability gradually diminishes the water flow is too low. 25 gallons is the maximum.